I wish learning how to do things the way that works for your family didn't take until the 3rd kid to figure out. There are so many things that we, as moms, do based off a friend or doctor's recommendation. We really didn't think to do it on our own time frame, mostly because we didn't know we could. For me feeding our boys solids was one of those things that I did solely because the doctor said I could. Being that eager first time mom wanting to rush through the many firsts that come along I went home and did them immediately. Now, I have wised up, and realized that some times you have to take your time with things. Wrennyn had been sleeping through the night and never was fussy (and clearly gaining plenty of weight) so when the doctor gave us the "go-ahead" on baby food, I decided he still wasn't ready. I didn't want to mess with his little tummy and do anything to agitate what was clearly working for us so far. So we waited. Then, Wrennyn's sign of interest definitely started to show. He was reaching for my food if he was on my lap during meal time. Licking his lips when he saw food enter our mouths and his eyes clearly were following any food items that were passing him by. Yep, he was ready! So far the transition has been MUCH easier than it was with the older 2 boys. Since Wrennyn is older he is was more aware of what is going on. Of course, the very first time with pureed food he gagged a bit, but it didn't take him long to decide he liked it! The other boys took about 2 weeks to really get the hang of eating. Wrennyn took 3 days. He is much more eager to get the spoon into his mouth and taste the flavor of the day! Where the other boys always resisted sat first. 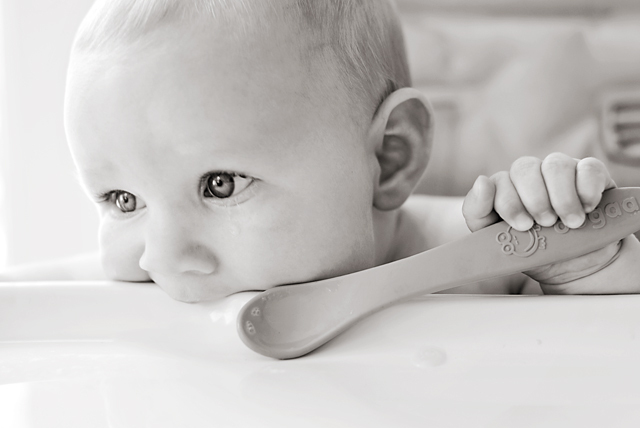 There is way less stress and mess with transitioning to solids with an older baby. Wrennyn certainly isn't gagging his food down and he isn't confused about what is going on, he is excited and engaged during every feeding and I wouldn't have it any other way! I am so glad we waited for him to show signs of being ready on his own, I wish I had known I had that option the other 2 times around! 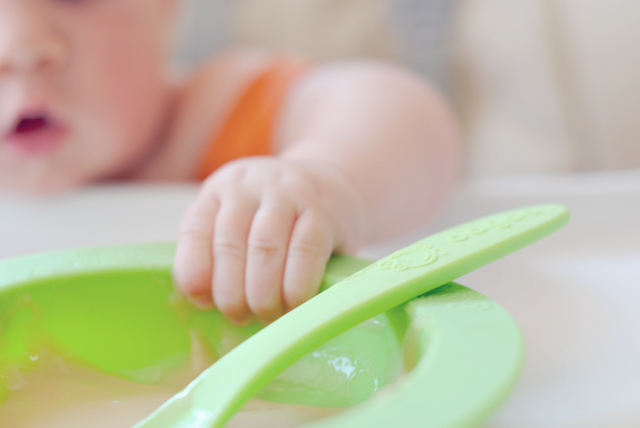 These textured Oogaa baby spoons (find them here) that create stimulation and interest as the food enters the mouth. Wrennyn loves these spoons so much that after only having been on solids for a week he prefers them over any other feeding utensils we use. He tends to hang onto them long after meal time is over. Also, we did a review on Oogaa a while back (see it here) see why we are huge fans of the brand! 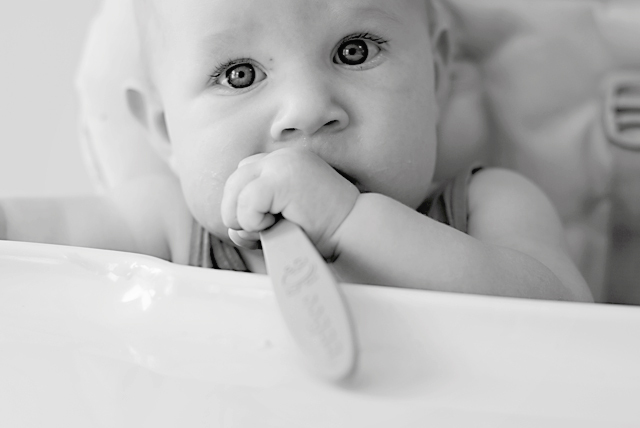 But not only that, Wrennyn tends to chew the incorrect side of the spoon and most spoons would be metal at the handle... thankfully the Oogaa spoons are silicon on all sides so there is no injuries to his sensitive gums during meals! These large adain and anais bibs (find them here) or these Gib's Bibs that my awesome client makes (find them here) both are soft and have great coverage - especially since Wrennyn is big enough to swipe the spoon and bowl it helps keep the messes easy to clean! If you have any questions on waiting on solids I would love to answer them - keep in mind these are all just based on my personal experience - it isn't the same for every baby! 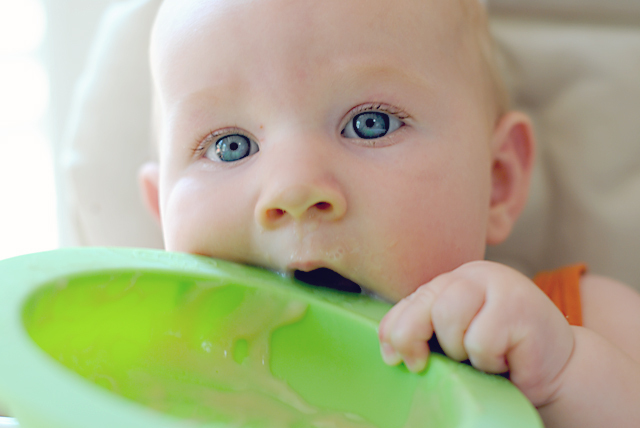 ** I know doctors say at 4 months a baby is technically ready and, or can handle solids. Just because they can handle them doesn't mean they are ready for them. Rowan always resisted them at first, and got very upset tummy in those first few weeks of transitioning - I just think if we had waited for him to show signs that he may have had a much easier time making the change. First time moms are always a little overwhelmed and unsure - so it is natural that we take an "experts" advice. But the truth is, you have mother's intuition for a reason, there are many things that you are doing just right, you just don't give yourself enough credit! I am so glad after 3 kids I am finally starting to feel confident in doing things my way! I am so glad to have found someone else with a similar opinion...! As my daughter started to grow, I felt a ton of pressure to give her solids--or supplement with formula. I never could understand why everyone was pushing the issue, when exclusively breast feeding was clearly working for us. 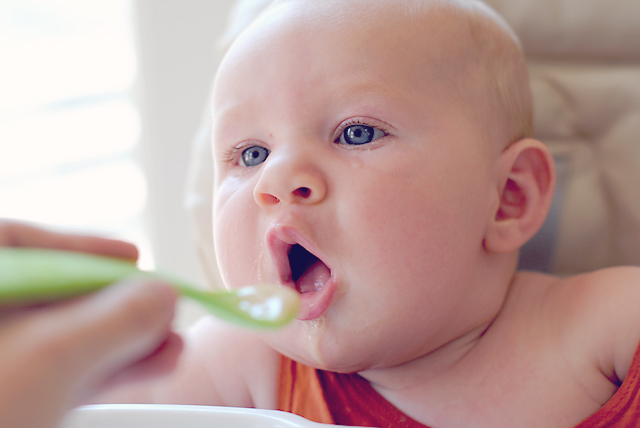 As my daughter approached six months, I made up my mind that whenever I felt it was the right time I would introduce solids to her. Even when she began to show an interest we slowly started giving them to her. She is over eight months now and still mainly nurses and I offer solids. Thanks so much for sharing your experiences!